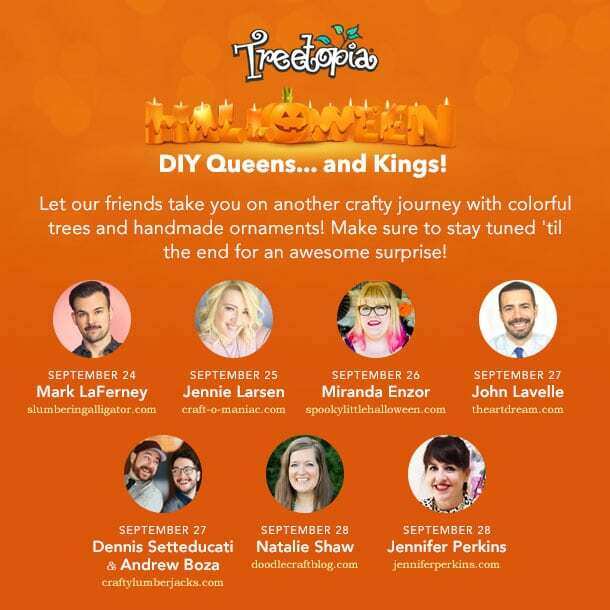 It’s that time of year again – The Treetopia Halloween DIY Queens and Kings Blog Hop season! 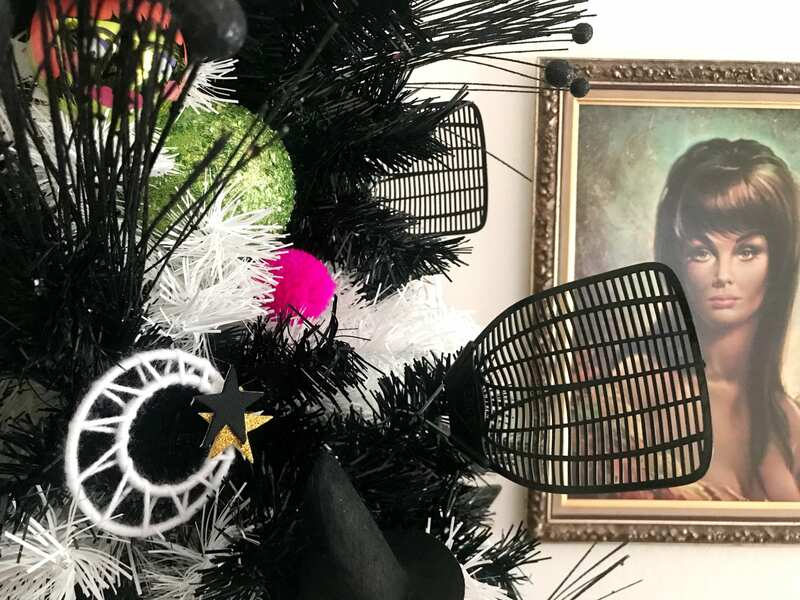 We have partnered with some awesome bloggers this year each of whom have not only decorated a Halloween Christmas tree but have also made their own DIY Halloween tree ornament. I can’t wait to show you how to make your own Mystic Moon Halloween Ornies! Oh and did I mention the giveaway – $100 gift cards to Treetopia so you can get your own Halloween tree? Boom! Full disclosure this is a sponsored post for Treetopia. I am their brand ambassador but I loved Halloween trees long before I was paid to. 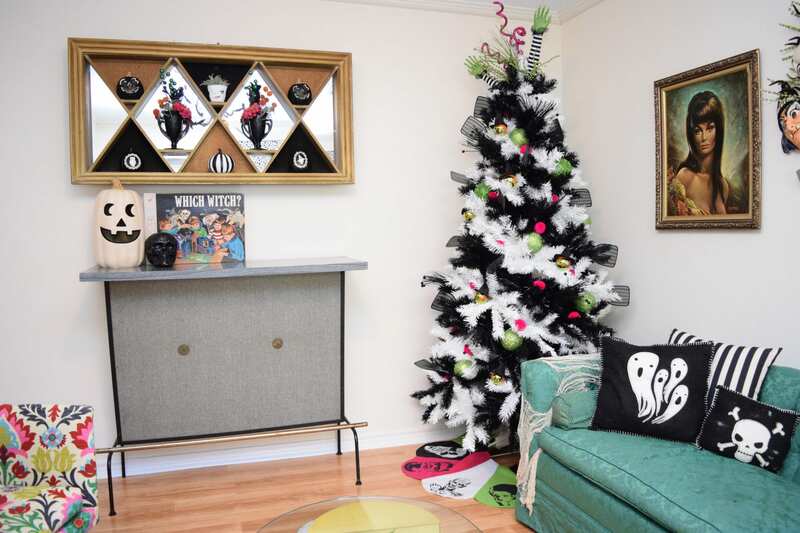 Each of got a different tree – mine is the Treetopia 7′ Zebra Striped Christmas Tree. How awesome is this striped tree, don’t even get me started about how excited I am to decorate the red and white striped version for Christmas. 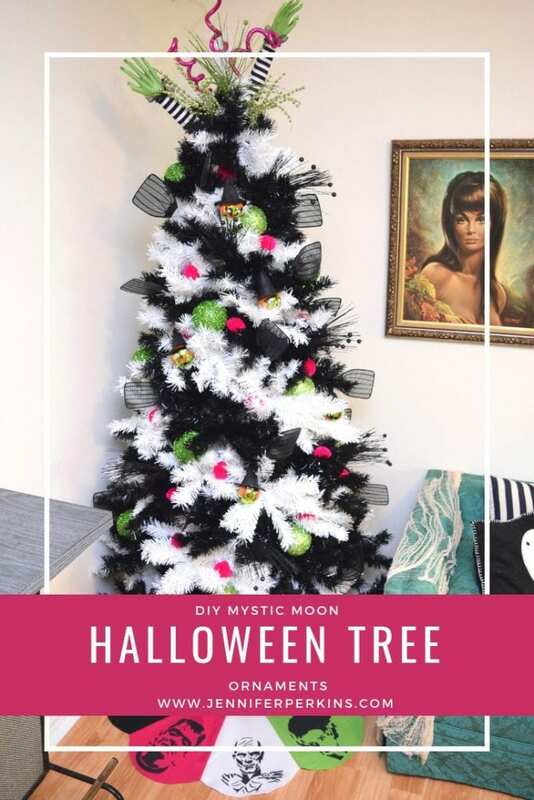 I covered my Halloween tree with a set of Treetopia Green With Envy Ornaments, pink pompoms, fly swatters and two different DIY Halloween tree ornaments: Witchy Woman and Mystic Moons. I’m going to show you how to make your own Mystic Moons, but first let me introduce you to all the other amazing Halloween DIY Queens and Kings! 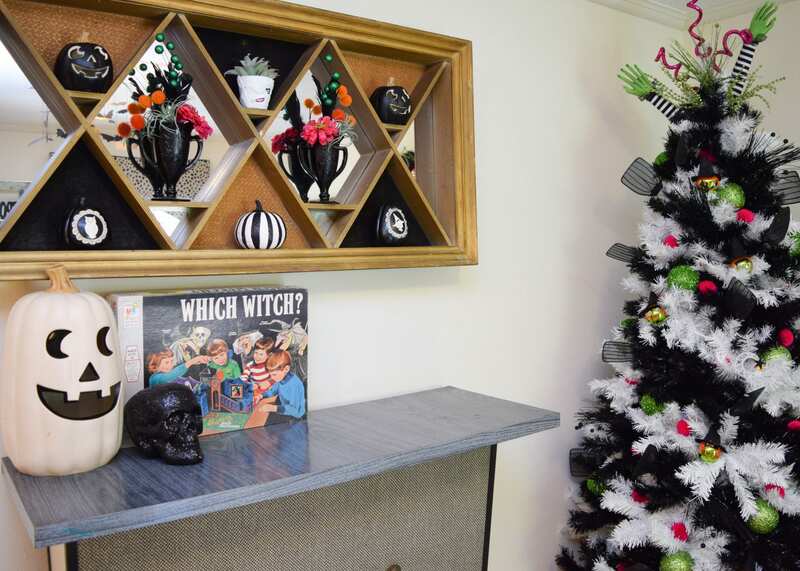 You guys there are some seriously cute Halloween trees in this group with equally amazing DIY Halloween tree ornament ideas. Each blogger is also running their own giveaway for a $100 Treetopia gift card. 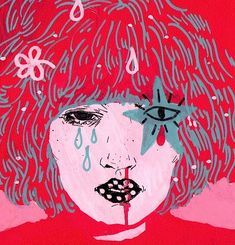 So pop over and check it out. 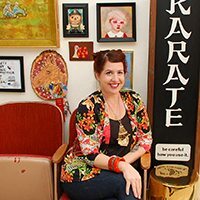 Not only that Treetopia is running a quiz and giving away 3 $100 Treetopia gift certificates. 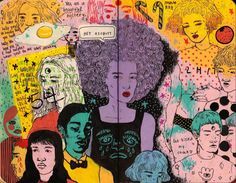 Contests runs through October 10, 2018 so be sure to enter there as well. That is a lot of chances to get closer to your dream Halloween tree people! So are you ready to make your own Halloween ornaments? I’m super smitten on these mystical looking moons and they could not be easier to make. 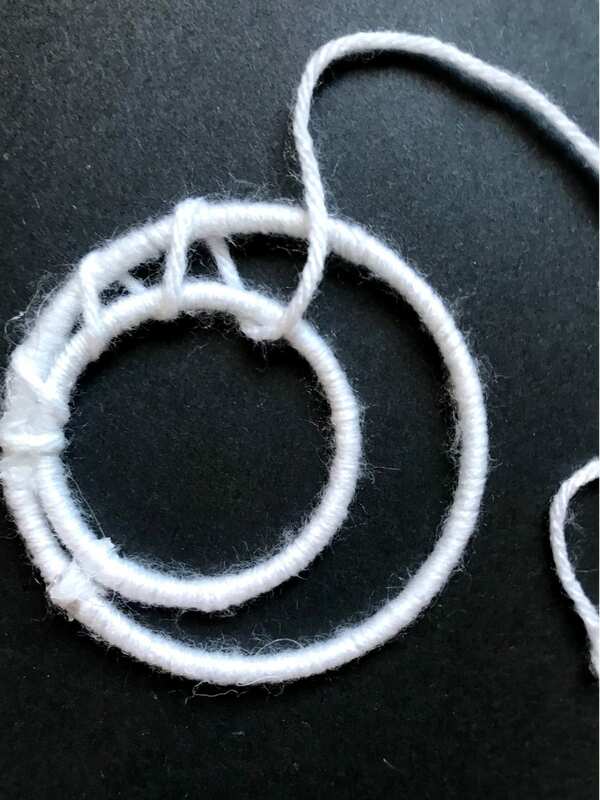 Put a dab of glue to attach yarn to each ring. Begin wrapping until entirely covered with yarn. My moons are white, but you could also do black for extra creepy-ness! 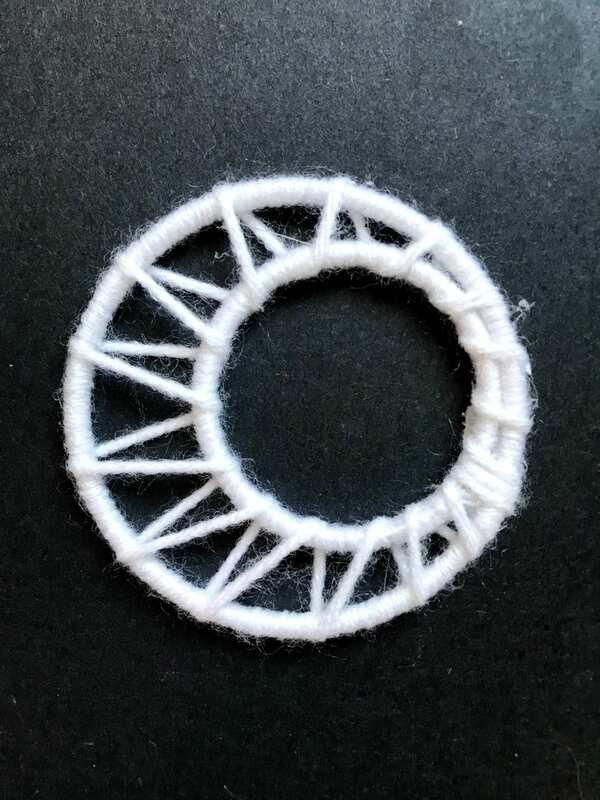 The metal rings I used can typically be found in the leather section of the craft store. They are often used for macrame crafts. One ring should be larger than the other to create the crescent moon effect. 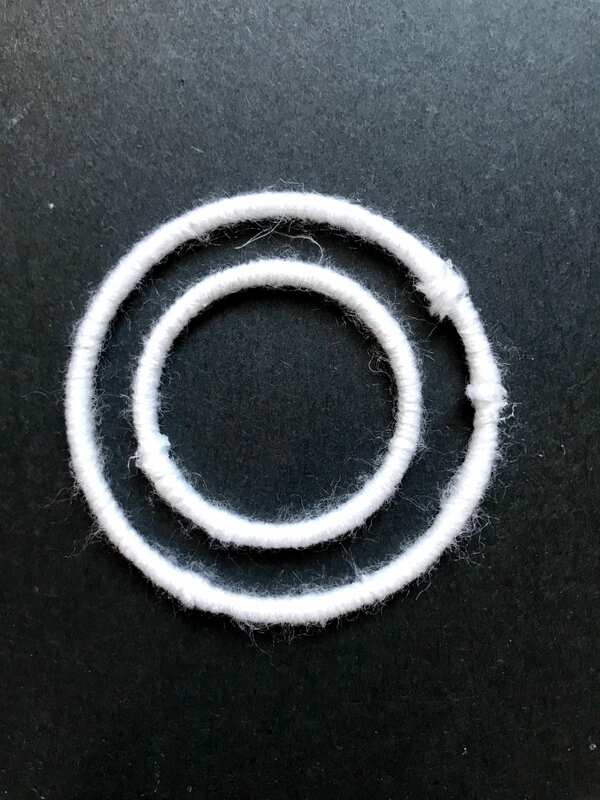 Add a dab of glue to attach the rings to each other on one side. The crescent moon shape is starting to show. 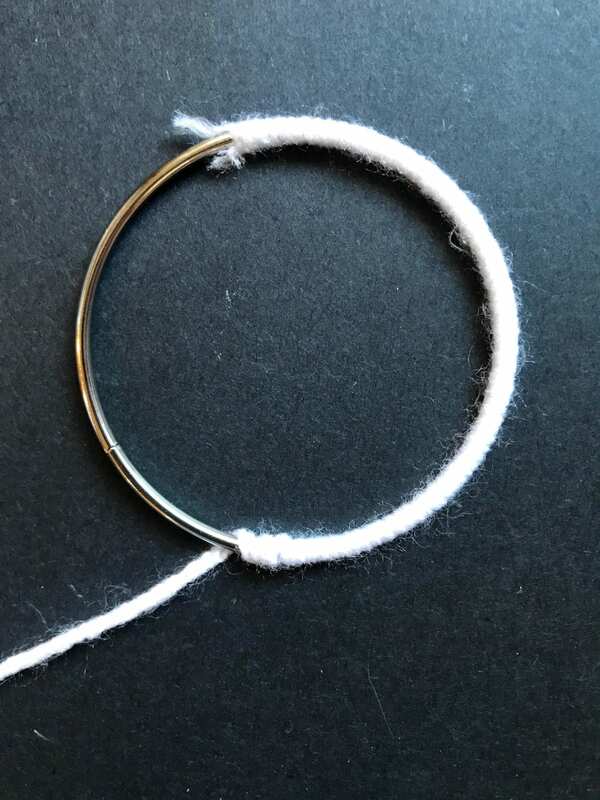 With another bit of glue attach a piece of yarn to wrap the two rings together. Wrap the two rings together leaving space in-between. Now things are really starting to look like mystic moons, but you know what is missing. 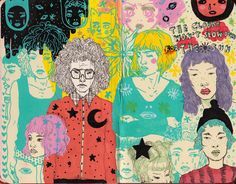 Stars – ya stars! 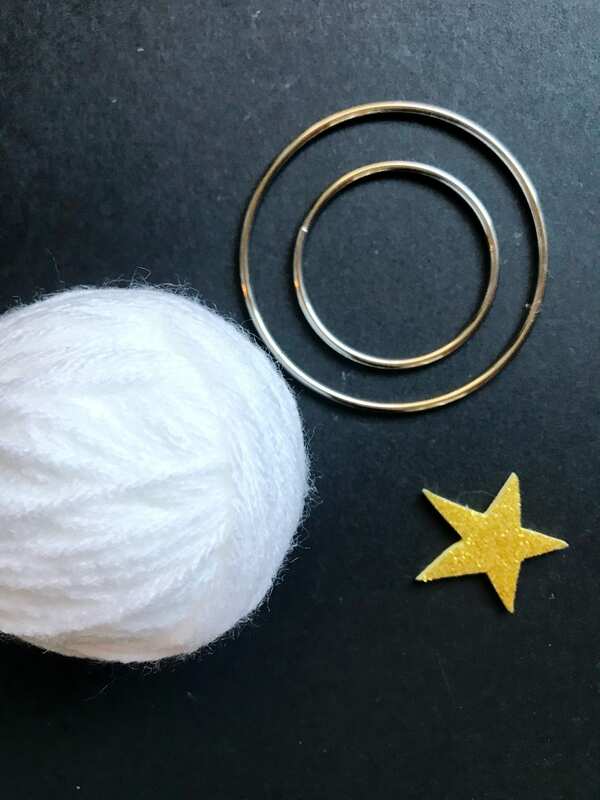 I used star shaped stickers, but you could also glue on paper or cut a star shape from felt. The stars really make the moons pop! 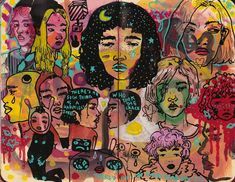 Love these moons? Try these other Halloween Ornament Ideas. There she is in all her glory – my latest Halloween tree. What do you think? 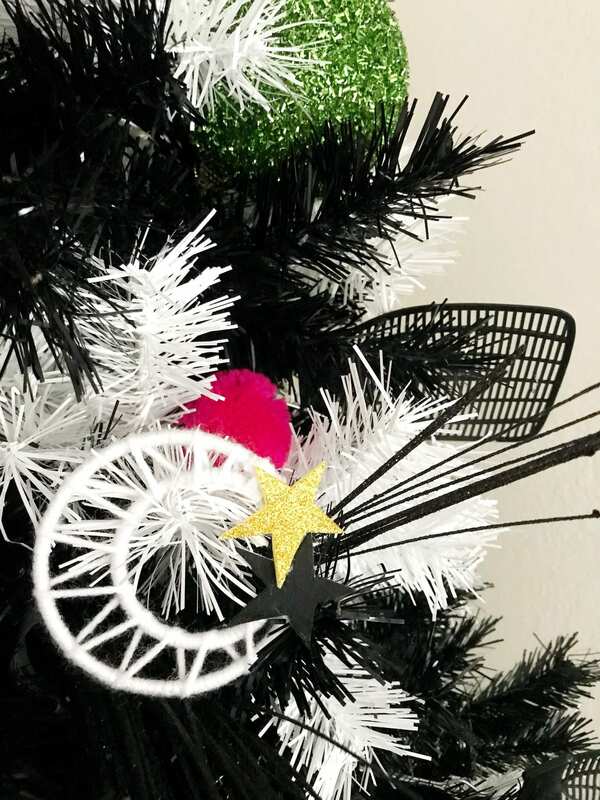 If you win one of those $100 gift cards from Treetopia think you might put it towards a black and white striped Christmas tree? Now how can you win the $100 Treetopia gift card I’m giving away? Well I’ve got all the details over on Instagram. You have until October 1st to enter! Posted September 28, 2018 & filed under Halloween, Holidays.